Spider-Man for PS4 features a lot of new twists on the classic hero. His relationship with Mary Jane and Miles Morales is different, his Aunt May is younger than she's typically depicted, and most obvious, he's sporting a unique suit designed by developer Insomniac. But if you're not a fan of this modern take on the classic red-and-blue spandex, you can always acquire more costumes by completing various side quests and snatching up collectibles hidden around the city. If you want to know exactly what you need to do to get these outfits for yourself, we've put together a complete guide that'll show you how to unlock every Spider-Man suit in the game. But if you're just wondering about the origins of each suit and which comics you should check out to see them on the printed page, keep reading. Just like the in-game name suggests, this is the iconic Spider-Man look. But interestingly, it isn't his first (we'll get to that one later). Instead, this was designed by John Romita Sr., and first appeared in 1966 - four years after Spidey's comic debut. You can pick up just about any Spider-Man comic to see this design in action. A darker take on the Spider-Man mythos, Spider-Man Noir (though simply called "Spider-Man" in his universe) is basically what happens when someone asks, "What if Spider-Man, but steampunk?" If you want the character at his most pure, read the four-part mini-series the character debuted in or the sequel story, Eyes Without A Face. Be warned, though: these tales are much more grim and violent than your typical Spider-Man story. For a more toned-down version of the character, try the Web Warriors series. You can probably guess from the sleeveless hoodie design and proliferance of pouches, but yes, this suit was designed with the '90s comic reader in mind. Interestingly, this isn't actually a Spider-Man costume, at least not in the traditional sense - it was worn by Ben Reilly, a clone of Peter Parker. His introduction came via the convoluted (and ultimately very silly) Clone Saga, which is not recommended reading. But Reilly finally got some time in the spotlight and more depth as a character in the Dead No More: The Clone Conspiracy storyline in ASM, which led to the surprisingly good Ben Reilly: The Scarlet Spider series. After losing his spider-sense powers in a fight against Alistair Smythe, Spider-Man designed a new suit to protect himself from bullets (as he was no longer able to effectively avoid them). Thus, the Spider Armor Mk 2 was born. The first Spider Armor was a bulky bit of silver and black, but this new version is sleek and refined. It was largely only a stop-gap to deal with one villain, so if you want to see it in action, be sure to read the two-parter No One Dies. "But wait," you might be thinking, "I thought Spider-Man's Secret War suit was the black suit, aka the symbiote suit?" That, dear reader, is the Secret Wars, plural, suit. This is based on a five-part series called Secret War, singular. You'll only catch the tiniest glimpse of this suit in the comic, which is exceptionally dark and violent, but if you ever wanted to see what Marvel heroes would look like with a dose of Watchmen infused into the writing, check out the 2004 storyline Secret War. That's War, singular. While this suit debuted in a movie and not a comic (specifically, Captain America: Civil War), there are plenty of comics which showcase a younger Peter Parker navigating the difficulties of high school while also moonlighting as a vigilante. If you want a way different spin on the stories you've come to know and focuses on teen drama, check out Spider-Man Loves Mary Jane. While Spider-Man did get a very similar-looking suit when he traveled to an alternate plane known as the Negative Zone, this isn't actually that suit. In fact, this isn't a purposefully-designed suit at all; rather, it imagines what happens when Spider-Man is affected by the villainous Mr. Negative and his powers to... uh, make you evil (and also nebulous other things - look, his abilities aren't super defined). Negative has shown up in several stories, but his first is arguably his best. 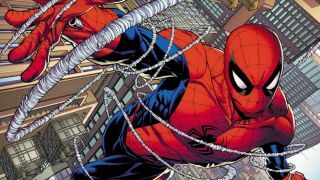 Read the Brand New Day arc (starting with Amazing Spider-Man #546) to see it for yourself. Also known as the "Electro-Proof Suit," this was a one-off design that Spidey created to combat... well, it should be obvious, shouldn't it? (Electro. The answer is Electro.) The suit has never come back into prominence, so if you want to read a story featuring it, grab the single issue of Amazing Spider-Man #425. Underneath this denim-and-spikes design, there's actually an entirely different Spider-Man - in the comics, anyway. Hailing from an alternate universe where the power of music, like, totally rules, Spider-Punk is a revolutionary leading an army of youth against a corrupt and totalitarian regime. Read the Spider-Verse arc to see him and a ton of other "What if" Spider-Men team up, or check out the Web Warriors comics to see him chew scenery with the tone of a Saturday morning cartoon. While the story of Spider-Man trying to make money as an amateur wrestler has been around since the character's inception, this particular costume seems to take its visual cues from the Ultimate Spider-Man series. The whole run is great, but check out Ultimate Spider-Man Vol. 1 to see Peter don this getup. What kind of suit would Peter Parker need to fight Norse gods? Turns out the answer is "one with a neon blue color scheme and bladed gauntlets." Another one of Spidey's short-lived, one-off costumes, the only place you'll see this one getting use is the seven-issue Fear Itself crossover series.